Brazilian-born artist Vik Muniz, who often uses common but ephemeral materials, meticulously recreated etchings from Giovanni Battista Piranesi's prison series using metal pins and thread. By presenting installation phootgraphs of his sculptural reconstructions such as the one depicted here, Muniz removes the viewer from the original objects created by Piranesi through a series of reproductions of reproductions. This is not done with the intention to mimic or even to improve upon the original, but to encourage the viewer to revist and look harder at the original while pondering the process by which we embed meaning into such icons. 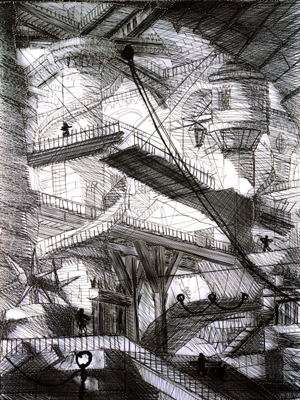 Both the original Piranesi prints and Muniz's reinterpretations were exhibited in 2004 at the National Academy of Sciences and in 2007 at the National Gallery of Victoria, Australia.